Home Horse News Do Horses Enjoy Jumping? 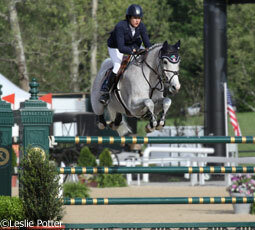 Jumping is one of the most popular equestrian pursuits worldwide. Hunter/jumper riders, eventers and fox hunters love the thrill of going airborne with their horses, and many will insist that their horses love jumping, too. But do horses truly like jumping? Or is their willingness to obediently do the job they’ve been trained to do mistaken for enjoyment by their riders? Researchers in Poland studied this question, and the results were published in the Journal of Veterinary Behavior this year. The researchers used two groups of horses in their study. One group consisted of 18 leisure horses, not typically used for jumping, and the other was 16 sport horses trained to jump. In the first test, horses were given two pathways to reach a food reward. One option sent them over an obstacle while the other avoided the jump but required a longer distance. The height of the obstacle was increased with every other trial. In the second test, the horses were tested under saddle with a Y-maze formation in which one arm of the maze included an obstacle. The obstacle used in the test was raised to a maximum height of 50 centimeters, approximately 20 inches. In 59.9% of trials, the horses opted to walk or trot over the obstacle, only opting to jump in 10.7% of trials. 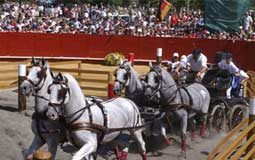 The horses’ willingness to clear the obstacle rather than choose an alternate route decreased as the height increased. When the height was set at 20 centimeters, 85% of the horses opted to go over it. By the time the height reached 50 centimeters, only 44% went over. The horses in the sport horse group did opt to go over the obstacle more than the leisure horses. This may be due to their prior training, their genetic predisposition for jumping, or a combination of both. However, both groups were less likely to jump the higher obstacles, even though most equestrians would not consider a 50-centimeter obstacle to be a challenge for a trained jumper. It may never be possible to know whether a horse actually enjoys jumping. The researchers conclude that while horses with training in jumping show more motivation to jump of their own free will, the fact that all horses were less inclined to jump as the obstacle height increased suggests that horses could easily be overfaced during training. I never really thought about it, but I did know that some horses like to jump and others did not, since I have a horse book that talked about it and showed pictures of a horse disliking it and one liking it. I have memory of reading somewhere that jumping was silly to horses, because they could just as easily go around it. 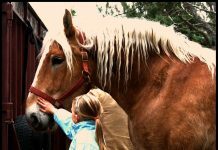 I think there are lots of activities that horses enjoy with humans that the horses wouldn’t do in the “wild.” One of the things a human can do for a horse is think of fun, interesting ways to move together in harmony. Jumping is only one of those things. However, forcing horses to jump (or do any other activity), or pursuing our own obsessions and goals at the expense of our horse’s health or happiness, is where horses and humans both run into trouble. That goes for recreational activities too, not just for competition and working and performance horses. It’s not the jump, the race, the dressage, the cutting, the reining, the trail, the whatever … I believe that it’s the human’s responsibility to be a wise and considerate leader who keeps the horse’s emotional, mental, and physical well-being in mind at all times. This can happen at the highest levels of competition and it can happen in the pasture when we’re 90 years old, resting under a tree with our 35-year-old pony. 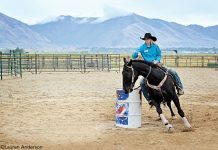 We can cause jumping to be enjoyable for our horses, even if they don’t choose to jump on their own. I think of it like this … you can love running, you can run in races throughout the year and compete for awards and medals and have fun with your running buddies … but you aren’t necessarily going to choose to do a 10-mile hill course or wind sprints on your way to dinner. Just because horse picked the easier route without the jump does not mean it doesn’t like to jump. I love to jump but if I was heading for lunch I’d probably pick the route without obstacle. And I know my horse loves to jump. When I say jump he gets all excited and looks around for it! I will have to set up jumps to see if my girls like to jump. Horses will jump if necessary, but I do not think they do it for the fun of it. But I had a young horse, who would jump out of his pen, and when the “horse play” got to rough with the big fellowss, he would jump back in. I strongly believe some horses love jumping. (some not;) I was cruising on my horse in an indoor arena, and the horse headed right to the jump set up in the center of the arena, and jumped it. I also don’t believe this test was very accurate. I don’t think this test really proved whether or not horses like jumping. More it proves how lazy they are. we had a horse from the farm I rode at that was doing a beginner level class and his rider fell of so the horse left that ring went into the next ring and started jumping the bigger jumps in the ring all by himself.Funniest horse ever. He must have liked it.Its to bad that was before all the cells phones with videos. Maybe? My first horse, T.Walker/Welch Pony cross, would jump every downed tree he saw on the trail… Even with his head pulled way to the side. My current Morgan, at about 2-1/2 and never ridden at the time, when turned out for the first time in a large arena, charged around and jumped every jump that had been left up be a previous group of riders. I thought he just was surprised by them in his joy of the run. Then he came around and did it all again! I have been around horses most of my life and currently own a horse ranch. It has been my experience that horses are basically lazy. That is why some are hard to catch, because they know they will be going to work. I have seen a few horses that liked to jump but not many. Even those, do not like to do it often.